Returning home after a medical event such as an injury or new health diagnosis brings a huge sense of relief. It’s wonderful to know you’ll soon be sleeping in your own bed again and enjoying the familiar comforts of home. However, new health needs present new challenges, and you may be preparing to choose a caregiver to help you transition back home. The first thing you’ll need to consider is which care agency will provide the level of care you need. There are many different types of agencies available depending on the kind of services you need, and you can find out more information about which one can best help you in this post. The choice of an agency is the most important decision that you can make in securing the right care to transition home effectively. The right agency will do the heavy lifting by hiring qualified caregivers and preselecting the right person to provide the right care. Once you have chosen your agency, the next step is interviewing and selecting a caregiver to assist you with daily activities and needs. Asking someone to come into your home and help with your care is a big decision, and it’s important that you feel completely comfortable with that person. It’s easy to feel overwhelmed as you consider your options. The decision process doesn’t have to feel intimidating, however. By considering your expectations before the interview with and planning your questions ahead of time, you will be well prepared to find a caregiver you trust. Let’s look at three things you can do to help you make the right decision. 1. Prepare for the interview ahead of time. Choose a location where you feel most comfortable. You can schedule your interview in your home or at the agency. You may also want to have a meal with the caregiver or schedule the interview in a public, neutral setting where you can get to know the person without feeling any pressure. Many people choose to bring a family member or friend along so they can help you remember all of the questions you planned to ask. You’ll appreciate having someone else listen in on the interview so you can compare and contrast your impressions. 2. Decide what you want to accomplish during the interview. Would you like to see references or work experience? If so, let the person know ahead of time so they can bring these things with them. 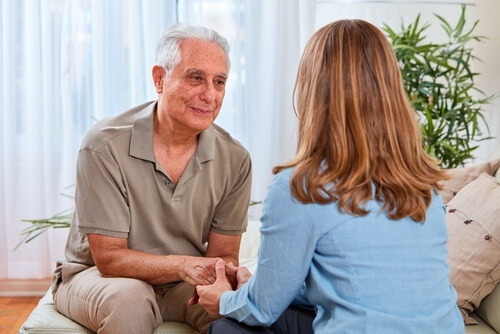 Would you benefit from speaking with past clients about their experiences? If so, ask for referrals before the meeting so you will have time to call. How long would you like to spend in each interview? Be sure to allow enough time to get to know the person and ask all of your questions. 3. Ask a variety of questions. Credentials and Background - Ask straightforward questions about the person’s experience with your specific health conditions, what credentials they have, how long they have been a caregiver, and why they are qualified for the job. Personality and Past Experience - Don’t be afraid to ask hard questions about how the person has responded to difficult situations in the past, what they would do if personality clashes arose, and what kinds of situations they feel comfortable with. Caregiving Scenarios - Consider asking hypothetical questions about what the person would do in a difficult or unexpected situation. For example, how would they respond if a family member expressed dissatisfaction with the care? What would they do in the event of a medical emergency? Specific Skills - Ask what specific skills the person has that would be beneficial to your health situation. What experience have they had in the past that have prepared them for the job? Can they prepare meals that meet your dietary guidelines? Do they have experience working with food allergies (if that is relevant to you)? Job Expectations - Finally, talk about both your expectations of the caregiver and their expectations for the work environment. For example, what do they find the most rewarding about caregiving? How does their past experience affect their approach to caregiving? Do they have a standard process for things like housework, meal preparation, and other services? Don’t feel intimidated at the prospect of choosing a caregiver. By planning ahead of time and knowing what questions you want to ask, you can gather the information you need to make a confident decision. Do you have questions about how to find a qualified caregiver or what services are available through a home care agency? We would love to talk with you! Give us a call to find out more about how we help.